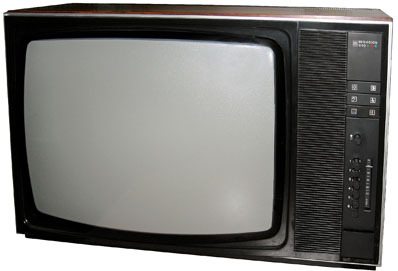 The Beovision 3100 used the same chassis as the Beovision 3400, though was fitted with a smaller 22” (56cm) picture tube. This resulted in a set which offered the same high quality as the Beovision 3400 but was slightly cheaper due to the lower price of the smaller tube. The Beovision 3100 was not noticeably smaller however, the size of the chassis meant that the cabinet size could not be reduced greatly. To avoid the smaller screen looking “lost” in the front panel the loudspeaker grille for the full range system was moved to the front, though it was still noticeable that the top and bottom of the screen were further away from the cabinet edge than they were with the 3400. Text copyright © Beocentral. Unauthorised reproduction prohibited. The Beovision 3100 brought with it one innovation, the loudspeaker was housed in a moulded internal cabinet to improve the sound quality. This practice would remain standard in quality Beovisions right up to the present day. Text copyright © Beocentral. Unauthorised reproduction prohibited.